The story of the Lamborghini Company is interesting on its own and deserves a separate telling. The brand was set up in 1963. First, the firm dealt with the creation of tractors and, by the way, does not still betray this kind of activity. At the same time, off its first model Lamborghini 350GTV, it literally fought the path into the world of sports cars, having solidly carved out the niche in the production of the fastest and the most prestigious sport cars in the world. The choice of colors of the Lamborgini logo holds a great resemblance to the Ferrari logo. In addition to this, the very shape of the emblem definitely reminds the Ferrari shield. Many experts consider it nothing but a coincidence. However, rumor has it that Ferruccio Lamborghini copied Ferrari logo on purpose and then inversed the color scheme just to prod Enzo Ferrari. Taking into consideration the longstanding enmity with Ferrari, this explanation seems reasonable. Ferruccio Lamborghini was manufacturing tractors at the plant in the Italian city Santa-Agatha. Since 1963, he started to produce sport supercars. The firm changed its owners more than once. Today Lamborghini belongs to Audi. The bull is depicted on its emblem, as on the family Lamborghini blazon. The choice of the bull has a reason behind it: in the neighborhood of the native village of Mr. Ferruccio Lamborghini, pedigree bulls were grown since long times. Therefore, Ferruccio chose this animal as a symbol of mechanical power. It is important to emphasize that, in general, the topic of bulls and the corrida is extremely relevant for the company and the majority of novelties receive their name in honor of some winners of the corrida. Gallardo, Murcielago are names of bulls victorious in different years. 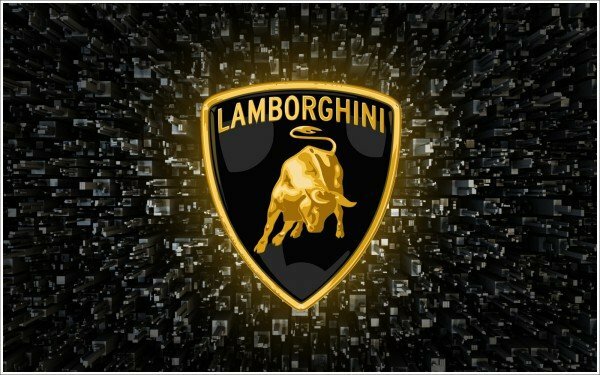 The Design of the black-gold symbol was offered by the company founder, Ferruccio Lamborghini, as well as the bull situated in its center. The symbol of Lamborghini cars, the ropeable bull, is interpreted differently. However, both interpretations quite combine with each other and, most probably, together became the cause of its origin. So, on one hand, the bull symbolizes the “agro-industrial” past of the company. On the other hand, the bull was the zodiac symbol of the firm founder Ferruccio Lamborghini. He was the Taurus by horoscope. There is also a legend, which runs that Lamborghini supposedly duplicated the Ferrari shield and then changed colors into black and golden one to score a point of Enzo Ferrari. As the chief participants of this incident left us long ago, probably there is no way to find out if it is the truth. The gold color in the Lamborghini logo features excellence and rich tradition of the automaker. The black color signifies its power, prestige, integrity, and style. Today the cars with the Lamborghini emblem are the sign of the success in life. Its models become more perfect and always remain in the spirit of the time. Advanced achievements are used in the design of each emblem. The Lamborghini Company has large plans for the nearest future. Not so long ago; it launched a “mad” Huracan with the rear wheel drive, and many admirers of the make began to wait for the appearance of the similar version of Aventador. All the future modifications of the supercar Aventador will be fit with the all-wheel-drive system. By the way, the design of other rear wheel drive cars is conducted in the company. It is interesting that an idea about the crossover Urus with the drive rear axle was not rejected. Of other novelties, a certain race car under the sensational name Centenario, which the Italians will show in Geneva in the spring of 2016, is expected. According to the rumors, it will be a slightly modified Huracan, but it will appear with the Aventador engine, and its production will be limited to twenty copies. It has recently become known that the present owner of the Lamborghini brand can get rid of it.